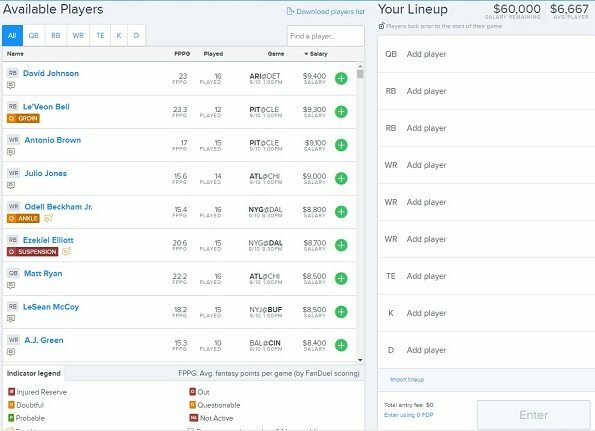 Draft your FanDuel lineup and follow your team’s progress anywhere at any time! Play NFL, MLB, NHL, NBA, Golf, and other Daily Fantasy Sports and win real money prizes! When you open an account at FanDuel, you’ll get a free entry into the NFL Welcome Free Play contest – no deposit required! Make your first deposit to get up to 3 x vouchers for the NFL Sunday Million with $4 million in prizes! Get a Free Ticket Just for Signing up! How do I Join FanDuel? FanDuel is a longstanding name in the daily fantasy sports world, having been launched in 2009. The company employs a staff of around 400 out of its New York City headquarters. There are more than 6 million users with accounts, and they can compete in the DFS contests of their choice through the web without having to download any software to their computers. 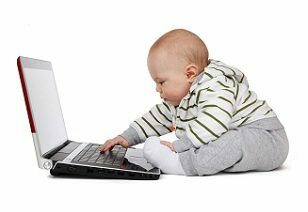 There are no legal stumbling blocks to playing on the site because the corporation’s lawyers have advised it on how to remain within the law in every market that it accepts customers from. 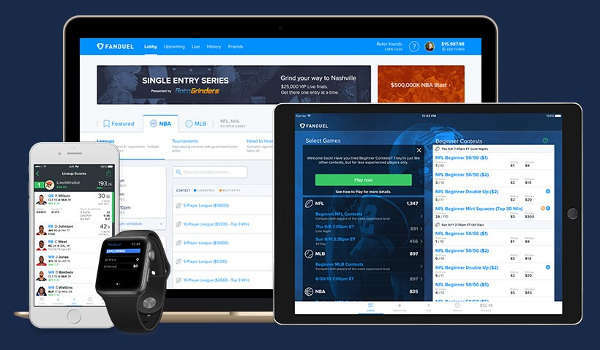 FanDuel hosts a range of games of different sizes from small-stakes head-to-head competitions to tournaments with thousands of entries and prize pools that sometimes climb into multiple millions of dollars. Major sports franchises have taken notice: FanDuel is a strategic partner of the NBA. It’s also a partner of 16 individual NBA teams and 15 NFL teams. The firm has been valued at more than $1 billion by industry experts. FanDuel welcomes users from the United States and Canada. There are a few geographic areas from which it sadly doesn’t accept customers due to legal concerns. If you’re a resident of one of these states, then you won’t be allowed to make a deposit or enter a contest at FanDuel. After creating your FanDuel account, you’ll be credited with a voucher for the $10,000 NFL Welcome Free Play. This contest begins at 1 p.m. on Sunday, so complete your drafting and enter before this time. If you miss your chance during one week, then don’t worry because you can join in when it runs again the next week. Click on our link to visit the FanDuel website. Press the green “Join Now” button toward the left of your screen. Enter your personal details in the form that appears. Press “Play Now” at the bottom of the form when you’re done. That’s all there is to it. FanDuel will open your account momentarily, and you’ll be ready to play. Make sure to enter your correct information when filling out this form. 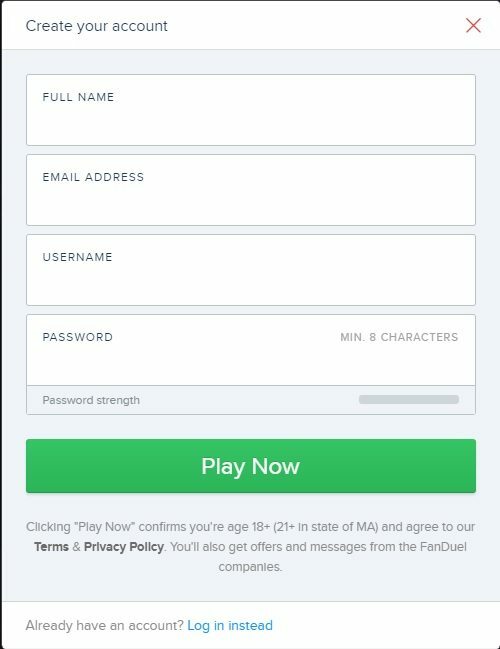 FanDuel will request your social security number and date of birth when it’s time for you to withdraw and will attempt to verify your identity. If there are any discrepancies, you could be in for a long wait, or you might not even be able to request a cashout at all. While logged into your FanDuel account, you’ll see a green “Add Funds” button near the top-right of your browser. Press it to access the cashier interface. There are a number of buttons with prefilled values listed, but you can choose “Custom” to type in any amount between $10 and $10,000. Then fill in the fields below with your financial details. You can fund your account with a major credit card (Visa, MasterCard, Discover) or PayPal. After completing these steps, select “Deposit funds. 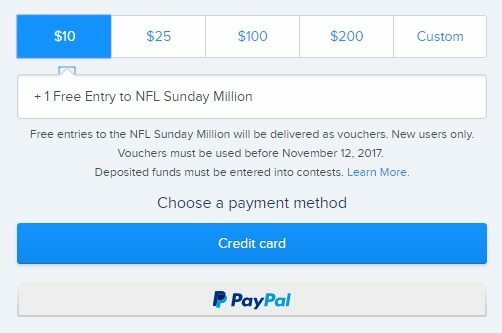 Upon your first successful deposit, you’ll receive vouchers good for entering the NFL Sunday Million, and the number you’ll get will depend upon the amount of money you’ve added to your account. If you deposit below $99, then you’ll get 1 ticket, but everyone who deposits $100 or more gets three of them. The NFL Sunday Million normally costs $7 to enter, so you may be able to score a $21 value for free if your transaction is large enough. The winner of the Sunday Million gets, as its name might imply, a cool $1 million. There’s an additional $3 million distributed to 2nd through 164,700th places. It’s important to note that there’s a special procedure you must use if you wish to enter a contest with a voucher. If you try to use the normal process for joining events (explained below), then your account will be debited the appropriate entry fee, and your voucher will remain unused. Click on your avatar at the top of the screen, which will bring up a menu. Select “Vouchers.” All the vouchers you have will be shown. Click on the one you wish to use, and you’ll be directed to the draft screen to compose your team. When you’re done, your voucher will be consumed rather than taking funds from your real money balance. Free no-deposit ticket followed by more tickets when you deposit. Click the “Lobby” on the top menu to bring up a listing of the contests that are coming up at FanDuel. By default, you’ll see the “Featured” lobby, but the lobby tabs let you navigate over to the sport of your choice. The information displayed includes the name of each event, its starting time, the current number of users registered, the maximum field size, the prize pool, and how much it costs to enter. Select any one contest to view more about it. You’ll be brought to the “Summary” screen for the contest you’ve chosen. Here, you’ll be able to learn what athletic games are included within the parameters of the competition along with the prize pool and how it’s distributed. In some cases, the prize listings are truncated to save space. Scroll down and choose “View all prizes…” to expand the information and view all the prizes that will be awarded. The “Rules & Scoring” tab contains data regarding how the points are calculated. You see, it’s the combined performance of all the players you pick that will determine your overall score and how you fare against your opponents. 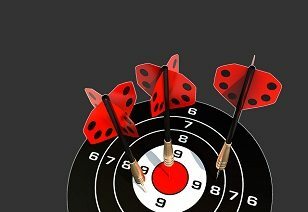 In most cases, you’ll get a specified number of points whenever one of your players does something positive on the field, like scoring a touchdown or sacking the opposing quarterback in football. However, there are certain instances when you’ll lose points, like when your player throws an interception or loses a fumble. Click on the “Enter New Lineup” button on the bottom-right if you wish to join the contest. The team drafting screen will appear. This shows you all the players available on the left separated into tabs by position. Your lineup will be shown to the right. If you click on an individual player, you’ll be able to see his or her season stats along with news and a game log of recent performance. You must pick enough players at specific positions to fill all the positions listed in your lineup. This prevents people from drafting teams consisting of, say, all quarterbacks, which would violate the spirit of the game. Click the plus sign next to any player to add him or her to your team. When you do so, you’ll observe that the “Salary Remaining” number will decrease. Each athlete has an attached salary figure, and the total of your team members’ salaries cannot exceed the limit shown. This prevents everyone from just drafting a roster of all-stars, which would make the game very boring. 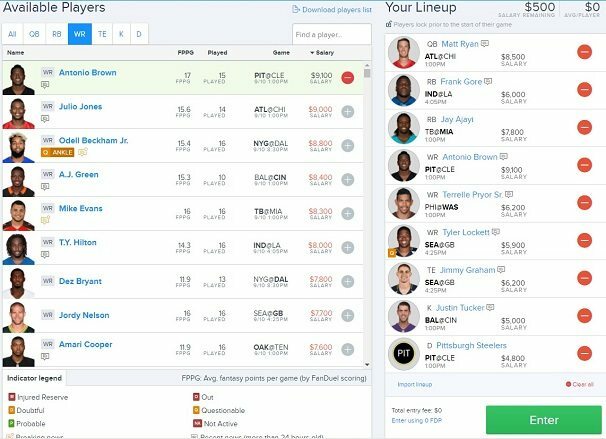 The tension between picking the best players and remaining under the salary limit is what gives daily fantasy sports its strategic complexity and depth. To remove someone from your team, click on the minus sign. When you’ve assembled your collection of players and are ready to enter the contest, press the “Enter” button on the bottom-right. Great! Now that your lineup is submitted, you don’t have to do anything else. When the contest begins, you can browse over to the “Live” section at the top of the FanDuel page and then follow your team’s progress as the action unfolds. With guaranteed prize contests, the total prize pool will be the amount shown even if participation falls a bit short of what the organizers were hoping for. The sums involved can be quite large: seven figures in some cases. Even if you have no change to spare, you can compete in certain free games that FanDuel provides. The prizes available aren’t really anything to write home about, but something is better than nothing. Most events at FanDuel pay more for first place and less the further down you go on the payoff chart. With Multipliers, every winner scores the same amount: a multiple of the entry sum. The upshot of this is that as long as you place in the money at all, you won’t have to sweat trying to achieve a higher position. No one who has played more than 50 games or won in excess of $1,000 can register for Beginner Contests at FanDuel. 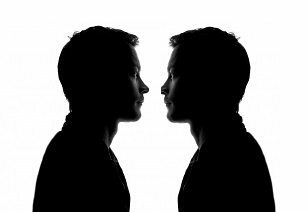 They’re intended to allow you to dip your toe in the waters, against others with a similar level of experience, without being preyed upon by savvier users. If entering one lineup into a contest just doesn’t satisfy you, then you’ll be glad to note that you can join most FanDuel contests multiple times. This gives you many ways to collect prizes, and all of your in-the-money results will add up together to generate your total winnings. Pit your skills against a single adversary in head-to-head matches. Join a match created by someone else, or add a new one yourself. You can limit entry to just your friends or open up your contest to everyone if you feel like challenging the world. With lineups of just five players, the Mini contests at FanDuel are perfect if you don’t want to spend tons of time poring over the list of available players. These games are quick to enter; yet, you can still win a lot of real money just like in the traditional contest format. 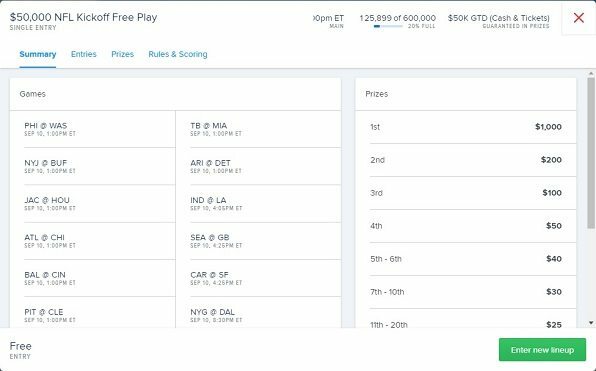 Contests at FanDuel are typically locked once the first game in the slate starts, and you can’t make lineup changes thereafter. 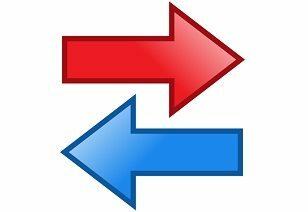 However, in events that permit late swap, you can adjust anyone in your lineup until the first game that particular player is participating in begins. 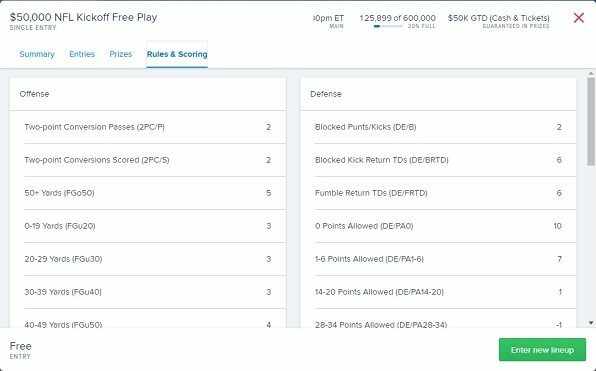 After you’ve gotten over the initial flush of excitement at joining FanDuel and playing your first few contests, you might want to familiarize yourself with the Lobby system in more detail. If you’re unacquainted with it, you might spend a lot of time clicking around to find what you’re looking for. When you choose “Lobby” from the menu at the top of your browser, the “Featured” lobby will be displayed on your screen. This shows you a pretty decent selection of the most interesting contests that are coming up soon, but you might want to click over to one of the other lobby tabs because they contained advanced searching features that enable you to more accurately sort through the specific contests you wish to play. After selecting a league, your lobby view will be adjusted slightly although it will still conform to the overall look and feel of the Featured lobby. Each league that’s in season will have categories that you can select, like “50/50s” and “Beginner Contests.” At the top of the listings, there’s a search bar. Type in the name or partial name of any event you wish to see, and the matching results will be populated below. To the left, you can select which slate of games you want to see contests for, and you can expand each slate to see exactly what matches are included. A couple of sliders permit you to establish the range of entry costs that you’re willing to pay. You can elect to view all contests, those that only allow single entry, or satellites. All of these filters make it easier to eliminate the clutter and focus on what truly captures your attention. You can craft your own custom contests at FanDuel and invite just your friends or make them open to the public. Select your preferred league, time, number of contestants, price point, prize structure and more. Now you can take charge and create the experience that you want. If you’re attempting to submit the same roster to multiple contests, there’s a better way than doing it all manually. 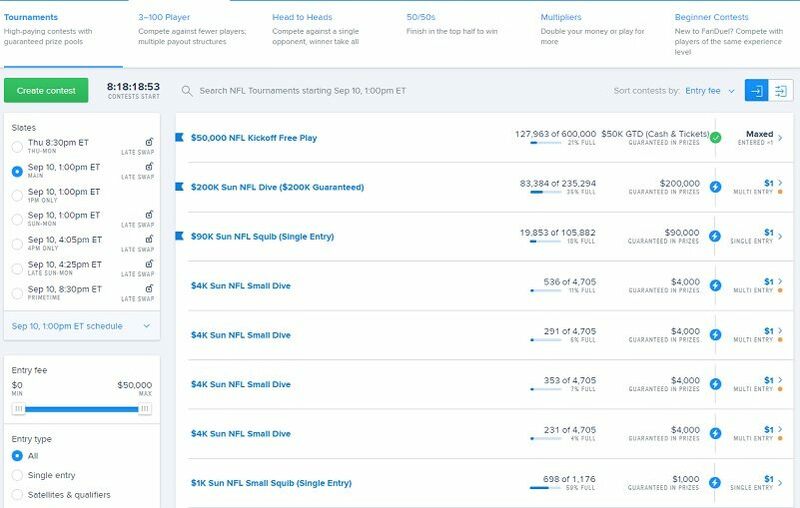 Through FanDuel’s Advanced Entry interface, you can choose all the contests you wish to join and then proceed to the drafting screen to compile your lineup at one single time. With the Friends Mode at FanDuel, it’s possible to begin a league and invite your friends to join. Each week will have a winner, and there will be a grand champion crowned at the end of the season. You get to decide the buyin levels, field sizes, and all the other particulars to generate compelling games for your group. Users who’ve played more than 500 contests or won $2,500 across six or more games have an “Experienced” badge. Those who have entered 1,000+ contests or won $1,000 across four or more games sport the “Highly Experienced” badge. Now you can gauge the abilities of the field before you enter! The FanDuel mobile app (for iOS and Android) is slick and smooth, and it actually won a 2016 Webby Award in the Sports category. All the normal functions that you can access from your desktop are present here, including depositing, picking a lineup, and entering contests. 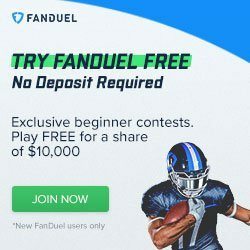 We’ve already discussed the no-charge contest that every new player can participate in and the free vouchers you’ll get when you deposit, but this is only the beginning of the promotions at FanDuel. You can read our review of the FanDuel promo code offer here. 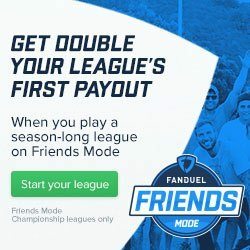 If you create a Championship league in Friends Mode, FanDuel will double the prizes for the first contest of your group. In order to qualify, your league must fill up to the participation limit selected. 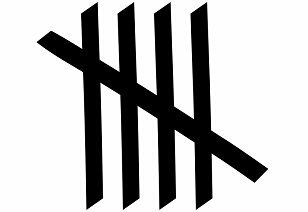 Remaining contests for the rest of the season will return to their normal values and won’t be doubled by the site. Whenever you pay for contests, you’ll get 5 FanDuel Points (FDP) for every $1 of the entry fee. 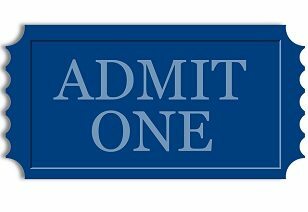 You can use these FDP to enter any paid event on the site. Within the drafting screen, you’ll see the cost in FDPs in addition to the normal dollar price. Status in the FanDuel Players Club is based upon your FDP points total for the previous month of play. There are five levels: Prospect, Pro, All-Star, MVP, Hall-of-Famer and Legend. As you work your way toward the top, you’ll get free play contests, weekly rewards and more, and the highest tiers even get a personal account manager and exclusive merchandise. 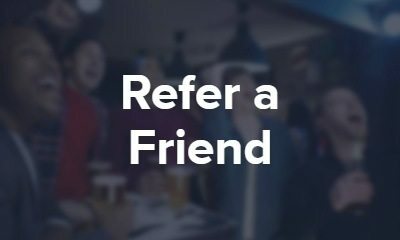 FanDuel creates a referral link for every user. When you get someone to join the site through your link, you’ll receive credit. 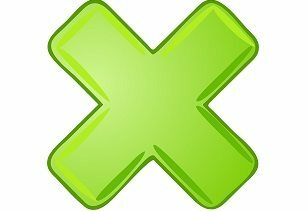 After that person spends $20 on contests at the site, you’ll receive $10 placed into your account, and your friend will also get a complimentary $10 credit as well. 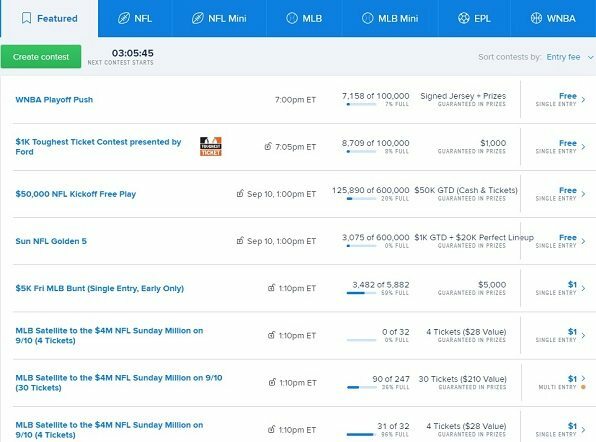 Despite the fact that FanDuel is a very well-run organization, you may encounter unexpected issues during your time at the site. The support section of the website has a number of documents covering common concerns that customers have. If none of them helps you, then you can submit a support ticket at any time. There’s also a live chat facility available Monday – Friday, 8 a.m. – 8 p.m. ET. Grab your free contest entries and double your Friends Mode payout. 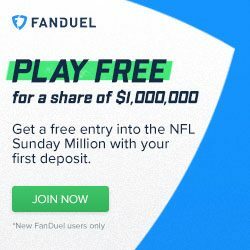 Find details on the FanDuel promo code bonus at FantasyFootballers.org. 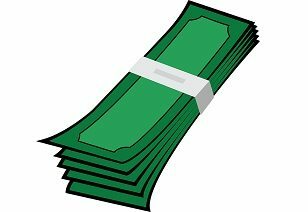 Hedge your DFS lineups with sports betting! We recommend the Bovada sportsbook and you can find the latest Bovada promo codes here. We also recommend checking out the Intertops Sportsbook. Check out these Intertops promo codes and get some free bets for NFL games courtesy of BonusPromoCode.com.